One of the more prolific local issuers of advertising trade cards during the Victorian era was Solomon H. Sylvester. Originally a barber and hairdresser in the 1850s (during which time he is noted as the inventor of the intriguingly-named "Golden Lutricon" for hair), Sylvester later in the 1860s and 1870s retailed gold and silver goods, pictures, frames and brackets from his store which stood on the site of 19-21 Center Street. Sylvester worked as, among other things, a taxidermist and even wrote a popular manual on the subject. (It went through at least three editions). In this line of work, Sylvester seems to have done a wide business, including work for naturalist John Whipple Potter Jenks of Peirce Academy in Middleborough. Many of Sylvester's specimens were featured as an attraction in his Center Street shop window, and undoubtedly through these displays many Middleborough residents were treated to the sight of animals otherwise unseen by Victorians. In April, 1867, it was reported that “Mr. S. H. Sylvester has just stuffed a gorilla for the menagerie at Boston. The owners valued it when alive at $1000”. The winter of 1868-69 saw Sylvester stuff "five beautiful specimens of American eagles" and "several splendid 'bucks'", while in August, 1869, Sylvester was displaying in his shop window an African leopard which he had mounted for Munroe & Andrews, Taunton shoe dealers. Perhaps most importantly for posterity, Sylvester published a number of stereoscopic cards, several of which feature Middleborough in the late 1800s and provide an important visual record of the community at that time. Fortunately, numerous trade cards stamped with Sylvester's name and business survive to remind us of his eclectic business enterprises. 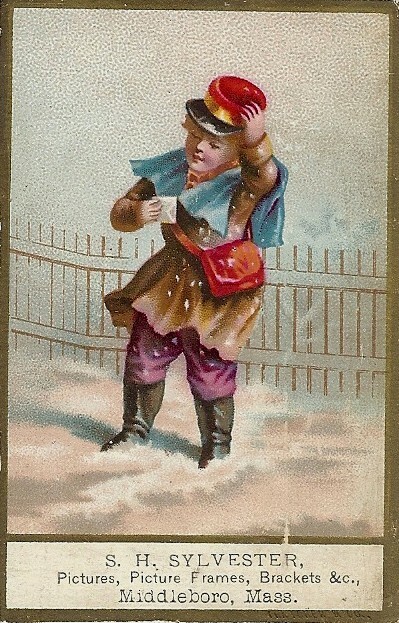 Here, a seasonally-appropriate trade card features a wind-blasted mail delivery boy during a winter storm. Middleboro Gazette, April 6, 1867; "What the Gazette Was Saying Fifty Years Ago", March 30, 1923; ibid., July 13, 1923. Old Colony Memorial [Plymouth], "Middleboro. ", February 19, 1869, page 2; ibid., August 13, 1869, page 3. Republican Standard [New Bedford], April 18, 1867, page 6. Sylvester, S. H. The Taxidermist's Manual. 3rd ed. Middleboro, MA: S. H. Sylvester, 1865.